In the decades before the Civil War, English readers confronted an extensive and influential pamphlet literature. This literature addressed contemporary events in scathingly critical terms, was produced in enormous quantities and was devoured by the curious. Despite widespread contemporary interest and an enormous number of surviving copies, this literature has remained almost entirely unknown to scholars because it was circulated in handwriting rather than printed with movable type. Drawing from book history, the sociology of knowledge and the history of political thought, Noah Millstone provides the first systematic account of the production, circulation and reception of these manuscript pamphlets. 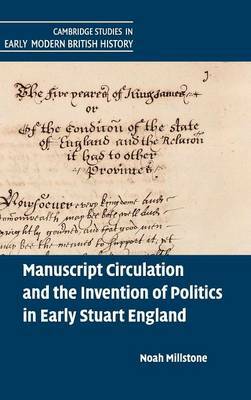 By placing them in the context of social change, state formation, and the emergence of 'politic' expertise, Millstone uses the pamphlets to resolve one of the central problems of early Stuart history: how and why did the men and women of early seventeenth-century England come to see their world as political?